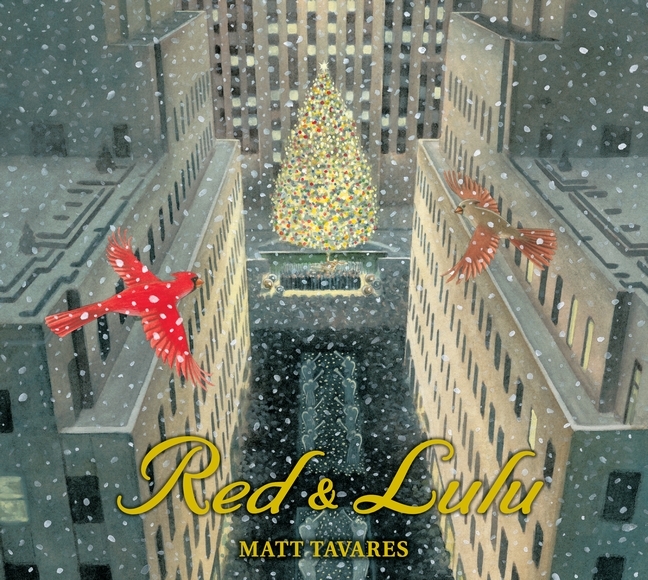 Red & Lulu is a beautifully told and gorgeously illustrated new picture book by Matt Tavares with a bit of interesting history at its heart. Red and Lulu are a pair of cardinals happily nesting in an enormous tree in the front yard of the home of a happy family of humans. The favorite time of the year for the birds is winter when the family strings colorful lights around the bottom of their tree, singing carols. But, one chilly morning while Red is out looking for breakfast, a flatbed truck pulls up in front of the house. As Red returns, he sees his tree, "strapped to the back of a big truck," the, "sweet sound of Lulu's song, coming from inside the tree." Red follows the truck until it gets to New York City. Bewildered by the new sights and sounds, Red continues his search for Lulu. 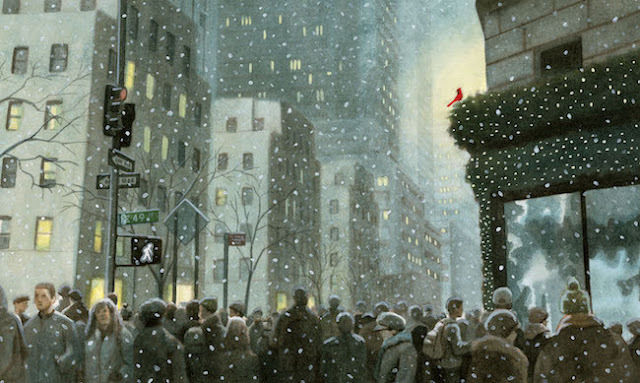 Tavares's illustrations show a snowy, bustling, busy New York City, bursts of red and green decorations here and there. Finally, Red gets a lead when he hears the Christmas carol sung around his tree, being sung by hundreds of voices. As Red flies toward the sound, he finds himself in Rockefeller Center where the tree - his tree - has been lit. Red and Lulu are reunited and happy, together again in their tree. Red & Lulu wraps up with the tree being taken away again! This time, they fly off together, making their new home in Central Park, "surrounded by trees and grass and lots of friends." But, "every year, when the air turns cold, Red and Lulu take a special trip." They return to Rockefeller Center where they snuggle together on a branch of the new Christmas tree and sing along with the caroling crowds. Tavares leaves readers with a page about the history of the Rockefeller Center Christmas Tree, the history of which is fascinating! Red & Lulu is a sweet story that combines a New York City Christmas tradition with a story of love that readers will long remember.